I’m living “Way Out West”. Been out here since 1993 when I moved out from Michigan, all the way to Oregon. And it’s a long way from home, and I feel it. Sometimes, I long for home. Once a year, I want to pack it all up and head back. Other times, I’m just fine that far from where I grew up. One time my Italian brother Martino Fumagalli said a little something to me…and it’ll stick with me forever: “Why do you live so far from your home?” He was puzzled. He’s never lived more than 50 miles from his birthplace. And it hit me hard. I didn’t have an answer for him. And I always think about it. I came out here for opportunity. For nature. For snow. For mountains. And those aspects are from a life lived long ago, some twenty years ago. I always think about that conversation. I live in Oregon. And I love it. 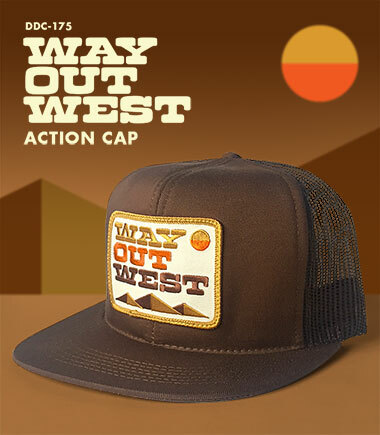 So I made a cap dedicated to living out west, and the mystery, beauty and glorious Western American expanses. Way Out West! 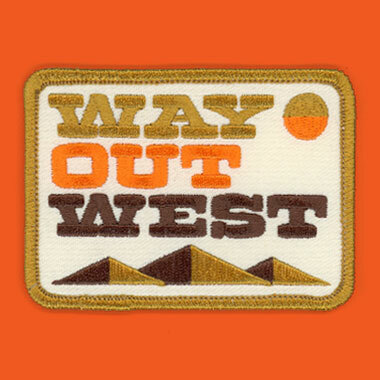 Here’s the “Way Out West” patch! Grab one and get weird out west! 04. Wayyyyyy out west! Can you feel it? 05. Manufactured by our Portland buddies at Brewery Outfitters. 06. Great for backpack, jean jacket, fatigues, rucksack, feed-n-seed caps and many other spirited uses.